The 3rd ASK 14 Meet was held July 24-26, 2011 at the Segelfluggelände in Kirn/Hunsrück Germany. Attending the Meet were nine ASK 14 motorgliders and pilots. We wish to thank the Meet organizers, Melanie Eckes and Jürgen Delzeit. We were please to have long distance traveler, Renatas Samulenas and his family attend from Lithuania. With the unfavorable weather forecast for the Meet, Renatas made a good decision to keep his ASK 14 at home. The weather was the big factor this year which kept some of the expected ASK 14s from attending the Meet. A scheduled training week at Nasttätten before the Kirn event saw lots of rain and very little flying weather. Heiner Backhaus from Blumberg near Lake Constance had the only flight during the training week. Heiner is an expert on the Hirth motor, and good information was shared among the owners. 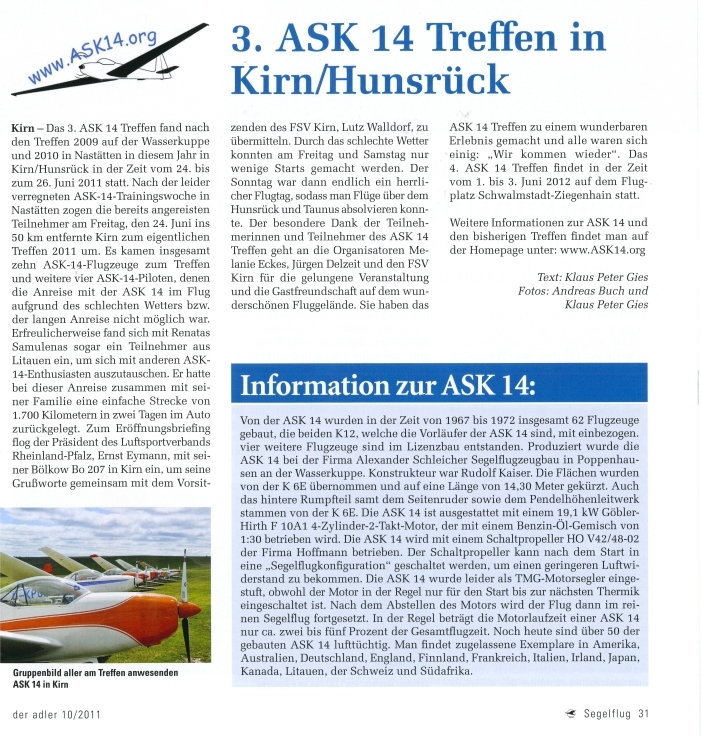 On Sunday, the last day of the ASK 14 Meet in Kirn, the weather gods gave us a beautiful day to fly our ASK 14s and see the beautiful Hunsrück region from the sky. All the ASK 14 participants would like to thank the Club President and the members of FSV Kirn for sharing their airfield and making us feel so welcome. We would also like to thank our sponsor for the 2011 ASK 14 Meet, LTB Follmann. The next ASK 14 Meet will be held June 1-3, 2012 at Schwalmstadt-Ziegenhain in Germany. Stefan Tandler from the FSV Schwalm is the organizer of the event. There ist a facility to start the ASK 14 "trainig week" from the 28th of May 2012. More information will follow on this website. This article is already 33570 Once seen.